The Fraser River near Chilliwack BC was the river of my youth. I fished it often, but almost exclusively from shore. As a kid dunking a hook and worm, I caught bullheads, suckers, pike minnows, catfish and if I was real lucky, the occasional trout. 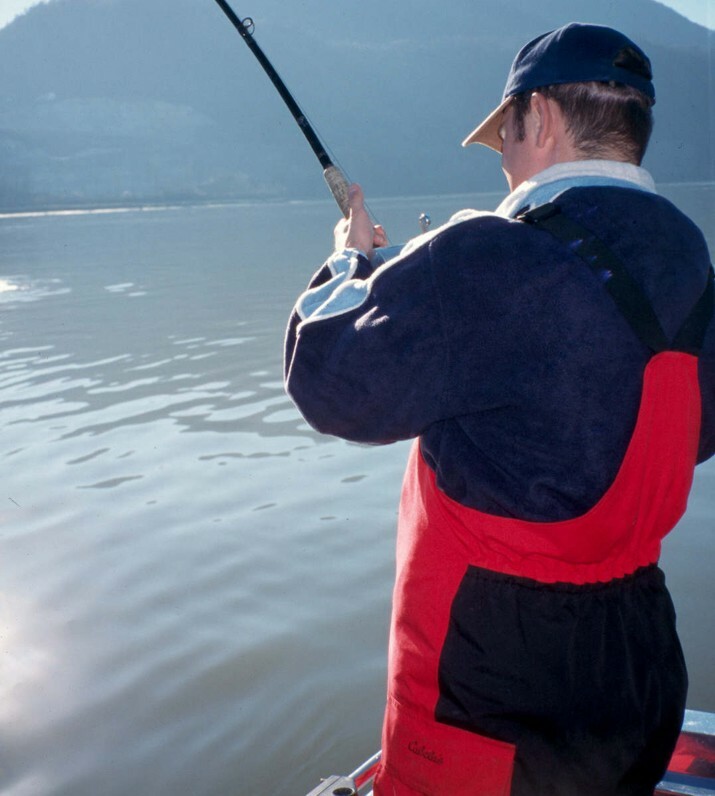 Salmon fishing on the Fraser was a part of my life, but only when my dad took me bar fishing with massive rods, one pound weights and larger than life spin n glows. Many days, however, it was simply the Fraser River and me. Other days I'd share time on the river with my half brother Cody and we'd always have fun, because we'd never know what we'd catch. But fishing on the Fraser cost money and back in the day Cody and I subsidized our trips by collecting bottles to buy the hooks and weights. For bait we'd hunt dew worms by night. 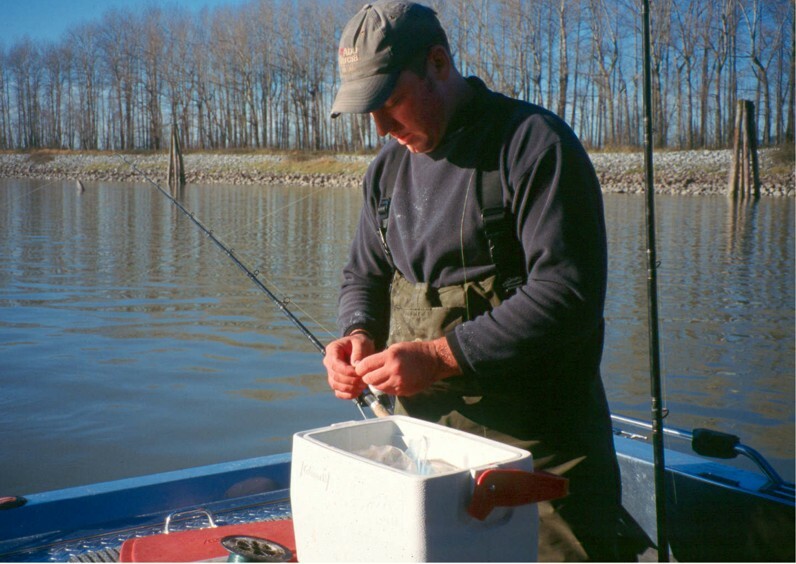 One day we were dropped off at the Fraser and, as usual, we were catching our share of coarse fish. Intermittently Cody would get snagged and break off and soon our hook and weight supply dwindled. Seeing Cody got snagged again, I told him he'd have to swim for his hook if he couldn't get it out. So he jerked and pulled moving up one shore and down another. He couldn't get it out so he tightened down his drag, pulled hard to snap the line when all the sudden, THUMP! His rod plunged toward the water only to pop back up, then it plunged back down again. Something was alive and it was coming up. 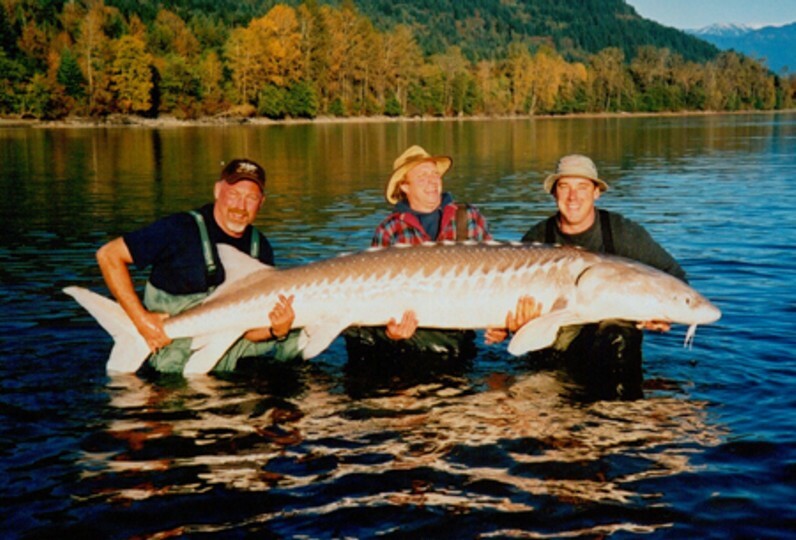 When the sturgeon broke surface, this seven or eight foot monster did a massive roll for both of us to see, then broke the line. Cody, who was paralyzed in fear from the onset, could only stare blankly. 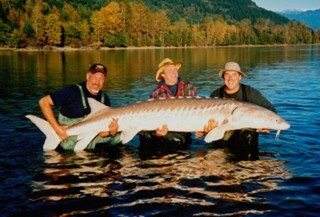 This was our first introduction to the world of big game sturgeon fishing. 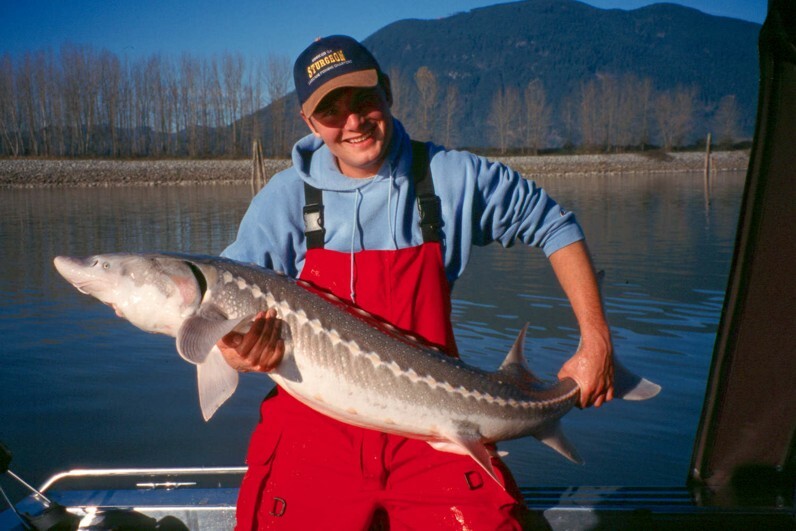 I've caught sturgeon since and recently, had the tremendous opportunity to go back to the Fraser River near Chilliwack with Marc Laynes of Cascade Fishing Charters. 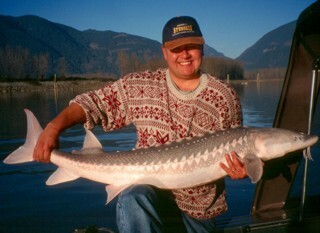 Marc is likely the most knowledgeable sturgeon guide on the Fraser and he does it up right. Equipped with a jet boat, local knowledge and all the tackle to handle fish that grow to over ten feet, this trip is a must 'go to' destination for anyone considering tackling the biggest gamefish freshwater has to offer. 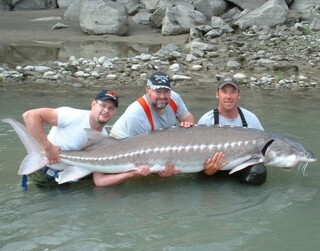 My buddy Chris Kindraka and I did just that and hooked up with Marc for two glorious days of sturgeon fishing. The average fish we were catching was three to five feet long and I got a beast that Marc estimated at 70 pounds. Chris caught several just slightly smaller. It was amazing fishing. 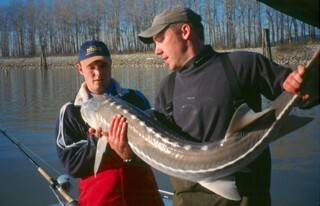 From the time the hook was set, many of these sturgeon launched themselves clear of the water not once, but several times. Battles raged on for 20 minutes and more and two spunky fifty to sixty pounders that hit back to back was enough to do Chris in. That was a hoot to see. I can remember Chris huffing and puffing, trying to reel in the second fish when Marc said, "This fish has got some jam." To which Chris wheezed out, "This fish is a jam factory!" Sturgeon fishing will leave you wore out, they pull that hard. I sent my buddy Trevor McLeod out to fish with Marc and he, along with his son Wilson tag teamed two particularly memorable sturgeon. The first started out with Wilson trying to reel it in, but he handed the rod over to dad after throwing in the towel at 25 minutes. This fish came in at 140 pounds. Then the next day it was Trevor's turn and he returned the favor in kind after a big white did him in. Wilson finished off the job and that fish materialized into a massive 180 pounds. They also caught one at 105 pounds and numerous 30 - 70 pounders. 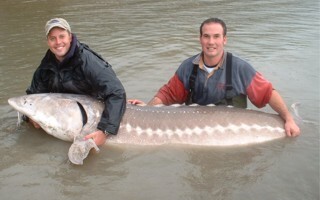 This type of fishing is unbelievable, but not uncommon. I've truly enjoyed my trips with Marc. It's first class all the way and I plan on going back fishing with him soon. He and his wife Maggie have a new bed and breakfast located near the top of Chilliwack Mountain, overlooking the Fraser. We stopped there a couple weeks back on our way through from the coast. It's a beautiful place, secluded in the woods, complete with blacktail deer wandering by the doorsteps. 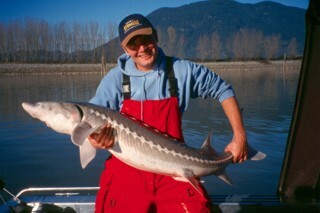 It's the perfect accommodation to complement the complete sturgeon experience. 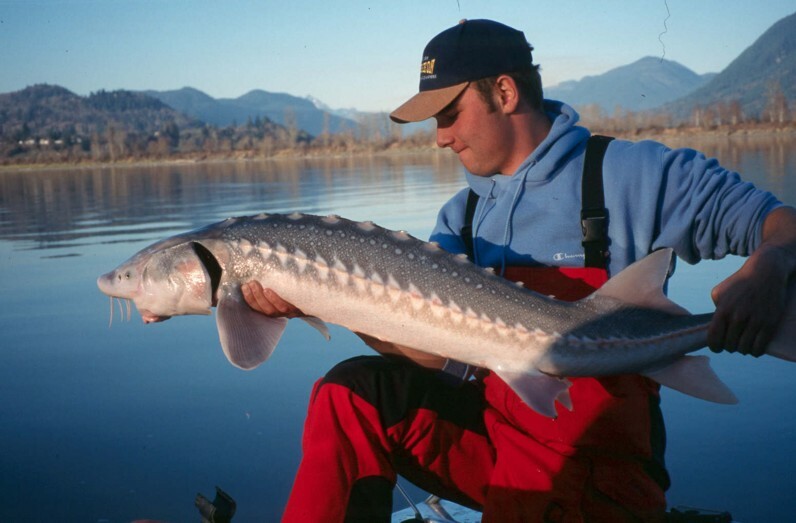 Head to the Fraser if you're looking for an amazing sturgeon experience. You can do it yourself or hire a guide. However, if you do choose to hire a guide, check out Marc. In my opinion he's the best! 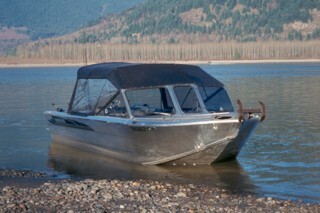 For more information log on to the Cascade Fishing Charters website at: "http://www.bcsturgeon.com"